Join us for a colorful collection of custom painted Calaveritas (’little skull’ in Spanish!) by a long roster of amazing artists from all across the country,and even some from across the sea. 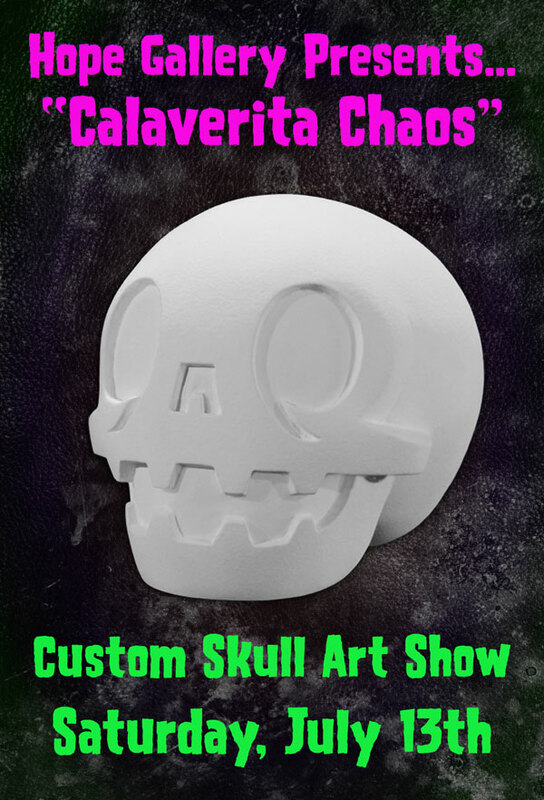 Blank Calaveritas and limited edition Glow-in-the-dark Sofubi calaveritas will be available for purchase the night of the show so you can take one home with you! Whatever is left from the opening will be available for sale online at The Hope Shop Monday, July 15th at 1pm EST. Travis Franklin, Amber Carr, Hannah Aitchison, Vinn Lattanzi and Jime Litwalk. This entry was posted in Art, Events, Hope Gallery and tagged art, artist, calaverita, custom, gallery, hope, hope gallery, new haven, show, skull. Bookmark the permalink. I feel bad tattoos can really make your life hell every time someone see it. I have a bad tattoo on my chest and do not have the income to fix it ! now every time I look at it it reminds me of all the foolish mistakes I made when I was partying and using drugs. I ‘am now four years sober and would love to fix this!